Clean out contaminants such as water, debris, and algae from diesel and other low-viscosity fuels to help prevent clogged fuel injectors and reduced fuel mileage on your fleet vehicles. 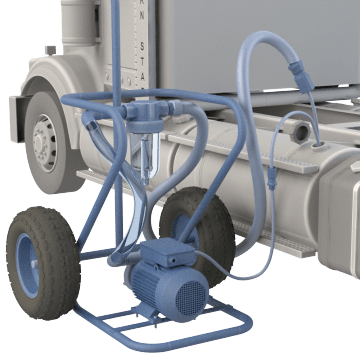 Use wand and hose attachments to remove sludge and other debris from the bottom of the fuel tank, then run the fuel through the system to filter these contaminants out. The fuel can then be transferred back to the vehicle for use. These devices are also useful in blending fuel while ensuring proper filtering. Not for use with gasoline.